Want to provide the most popular candy for your trick-or-treaters? MMs no longer rule; Reeses now #1! 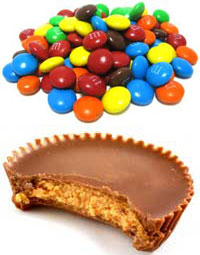 Sales of Reese’s regular size (less than 3.5 oz) peanut butter cups jumped by 7.7% in the past year, outstripping M&M’s from its top spot from the best-selling candy. Although it is the second highest selling regular size candy, it ranks only eighth among brands in snack-sized sales. In recent years Mars has pushed it with celebrity-filled ads based on the line: “You’re not you when you’re hungry.” The first commercial, which aired during the 2010 Super Bowl, was an instant sensation. (It featured actress Betty White getting tackled in a backyard football game.) But Snickers sales have still been falling. Sales of the company’s long-standing brands have risen recently, efidently due to advertising pushes. Over the past year, sales of 3 Musketeers bars fell by 9.6% to just over $101 million, the second-largest drop of any major chocolate candy bar. A relatively new addition, it is also one of just eight brands to record sales of more than $100 million in the most recently available 52-week period. Sales of standard-sized Milky Way bars rose by more than 5% to $93.4 million in the last year; sales of snack-sized Milky Way, typically popular around Halloween for trick-or-treaters, rose by more than 10%. In the past 12 months, the brand was one of just 10 to sell more than $80 million in the under 3.5 oz. bar category, the size customers typically buy at the checkout line in a grocery store or supermarket. This entry was posted in Halloween on October 27, 2013 by admin.